Visually I absolutely love this game, really stylish. The Undertale style battle system is fun, but the fight itself is rather hard due to the small screen size and lengthy attack duration. It's such as shame that the game's so incomplete, even death and winning haven't been fully implemented. I would love to see more of this in the future. Nice game, reminded me of Undertale. 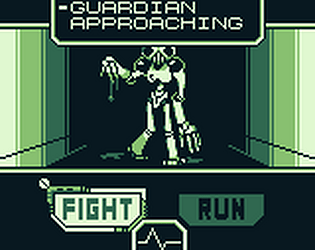 But after defeating the guardian, it switches to guardians attacking state and then nothing happens for me. I've never been able to get to exploration parts which seen in screenshots even after defeating the guardian for the 6th time. I would love to see it further, looks gorgeous! Very nice prototype! The UI in particular is really stylish. The collision during the enemy's attack and the timer on the player's attack both felt a bit unforgiving and obviously there's not much to do, but I'd be interested to see this expanded.